Once you're into the site, you can create an account. Click on Log In in the top right corner. The first time you log in, click on Register, but every time after that you just need to enter your username/password. You need to create a username and password when you register (don't worry about the rest). Use your student ID# for the username and WILDCAT for the password. Ask Mrs. Martin if you want help setting up an account. Click here to download the Mackin Via app for all kinds of mobile devices (iPad, Android tablet, Kindle, Nook, Mac or Windows computers), watch a video tutorial, and learn about the special features of using these eBooks. Take an AR quiz once you've finished the eBook! EPIC! provides an unlimited selection of eBooks that can be instantly discovered, read and shared with friends. EPIC! is the only place to access thousands of high quality children's books without the need to purchase or download them. Featuring fun, game-like elements, EPIC! provides kids with a library they can take anywhere. 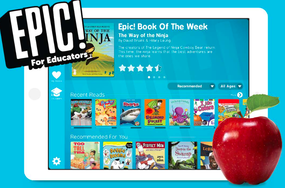 ​You can read EPIC! eBooks on a computer with a browser window or you can download apps for mobile devices. Click here to download the app for Apple devices. Click here to download the app for Android devices. Click here for "Reading Follett eBooks and Audiobooks" resources. e-books, videos, games, and more for 2nd-4th graders. You will need the INFOhio username and password.